It’s no secret that demonstrating a commitment to the environment is good for business. The “clean water economy” is increasingly championed by corporate, government and nonprofit organizations wanting to protect the economy, communities, and natural resources. “Dwindling water supplies are a greater risk to businesses than oil running out, a report for investors has warned,” The Guardian, 2009. 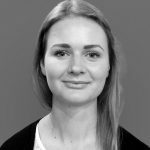 “Companies that treat pressing water risks as a strategic challenge will be far better positioned in future,”Mindy Lubber, CERES’ president and Peter Gleick, president of the Pacific Institute. Unilever pioneered the corporate social responsibility movement in 1997, when they joined with WWF to form the Marine Stewardship Council (MSC) following the devastating collapse of Atlantic Canada’s Cod fishery. Now an independent organization, the MSC assesses the measure of fisheries’ sustainability, and helped Unilever demonstrate their commitment to protecting the fisheries that sustained a multi-billion dollar industry. More and more corporations and businesses are getting on board with environmental and social advocacy; McDonald’s, for example, just announced their commitment to the White House American Business Act on Climate Change to reduce carbon emissions. Loblaw has committed to a number of environmental pledges, including the elimination of microplastics from consumer goods by 2018, a reduction in food waste, and diversion of waste from landfills. Countless businesses around the world, large and small, are realizing the importance of investing into the environment. This Ted Talk by Audrey Choi even goes as far as to say that money invested in companies that prioritize environment and social equity return a higher profit than companies that don’t. “Clean water economy” is no longer just a PR slogan. It’s key to the bottom line. Tying the environment into a company’s business plan is no longer just a nice-to-have. It’s essential in generating long-term revenue and ensuring the resources companies rely on, like clean water, are around to sustain a business for generations to come. The clean water is one of the biggest need areas for investment from businesses today. Clean water is essential for human health. 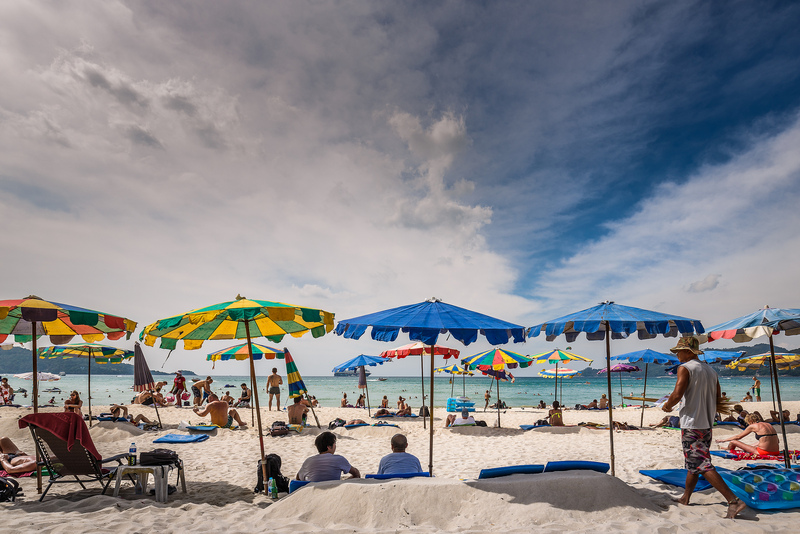 It’s essential for tourism and the enjoyment of recreational water bodies that surround us. Clean water drives economy, from natural resources to clothing manufacturing to breweries. So why are many businesses slow to embrace the clean water economy? Are they simply unaware that the value had shifted from one purely of morality to one of profit? Blue Business Council understands the link between clean water and business success. In California alone, the clean water economy is valued at $39 billion annually. Tourism, which contributes over $100 billion in revenue each year to California’s economy, is inherently dependent on the continued health and prosperity of its marine and freshwater environments. Yet, nearly all of California’s rivers and streams that were assessed were too polluted and degraded for fishing, swimming, and other uses. Hundreds of millions of dollars are spent cleaning trash and debris from California’s marine habitats, and more than half of all U.S. businesses are estimated to be impacted – both in growth and profitability – within the next 5 years due to water issues. Figure 1. 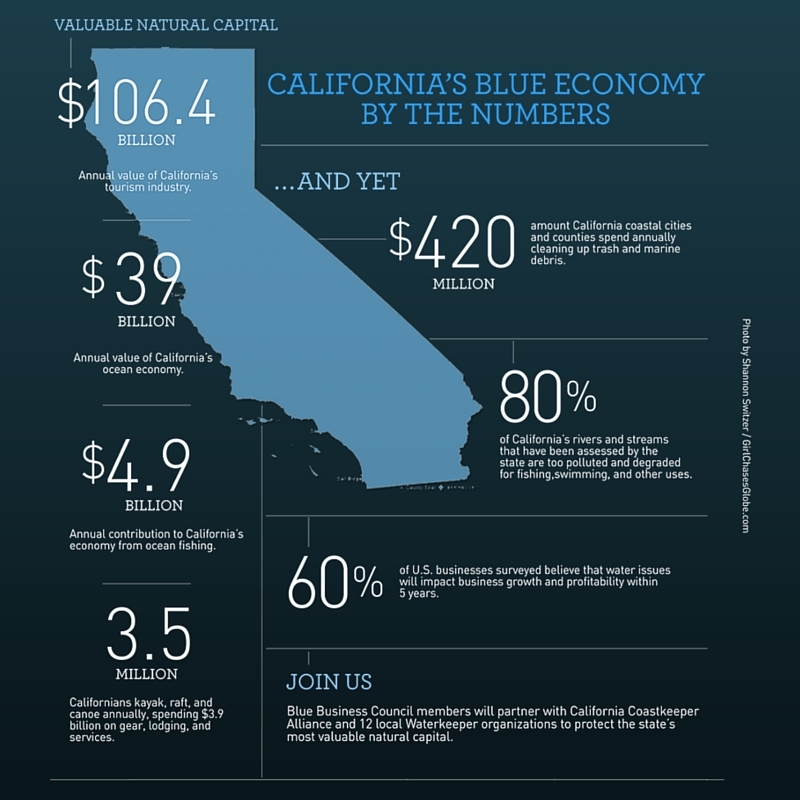 California’s Blue Economy By The Numbers, Blue Business Council (bluebizcouncil.org). This can scare us. Or it can spur us into action.